When cabinetmakers sand wood either by hand, with an orbital sander, a belt sander or other sanding device the eye can see sawdust being created. However, it's the dust that can't be seen, particles smaller than 10 microns, that pose a bigger threat to cabinetmakers. These "invisible" dust particles can, after prolonged exposure, cause a number of ailments, including several types of cancer. Whenever efficiency suffers, so does your bottom line. It's in these cases where taking a close look at the benefits of a tool like a downdraft table makes a lot of sense. 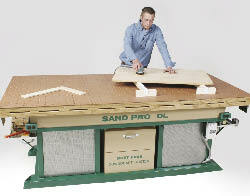 A downdraft table removes dust particles from the breathing zone of the person who is sanding on or above it. If someone is sanding on a regular table, dust rises and gets into the user's breathing zone. This doesn't happen with a downdraft table. "Before the downdraft table, people would have to wear a respirator or dust mask if they were sanding," Byron Blunt, director of sales for Denray Machine Inc., Mt. Vernon Mo., notes. "And that hinders the performance of that person. Because if you're wearing a respirator or dust mask all day long, your breathing is always going to be impaired regardless of how clean you keep them." Blunt adds that one of Denray's customers provided them with some provocative information on this topic. "We had one company in California several years ago that had done a test before and after we sold them seven of our tables," he says. "Before they bought our downdraft tables they had done an efficiency test with the employees to see how much labor time they lost because of the dust mask and respirators they had to wear. They found they lost 40 percent of their productivity. When they got the downdraft tables in, it was 100 percent for all eight hours." The make-up of a downdraft table is fairly simple. "You basically have a motor and a fan underneath, and you're pulling the air through filters of some sort," explains Nate Troyer, vice president, Sandman Products LLC in Elkhart, Ind. Dust then goes through filters and clean air is exhausted out of the bottom of the machine. As a result, there is no loss of conditioned air. Before downdraft tables were perfected, it was common practice for cabinet shops to take a bench and hook it up to their central dust collection system. 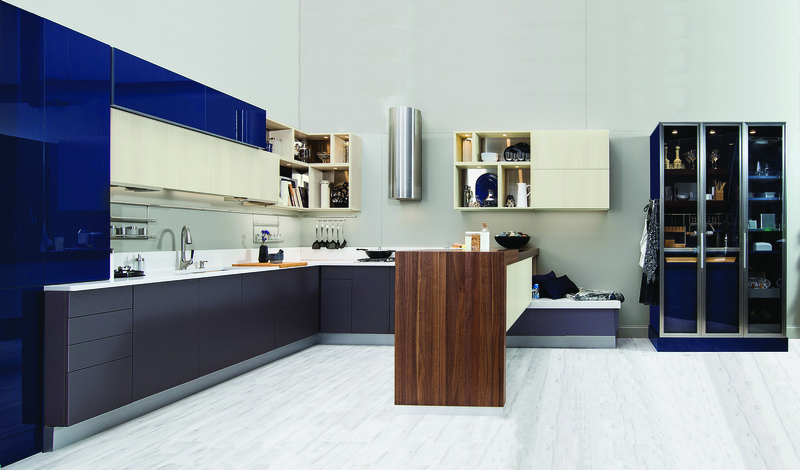 While that helped some, most cabinet shops could not sacrifice the amount of air movement needed. In addition, shops would lose their conditioned air. In contrast, a downdraft table is totally self-contained and recirculates. Troyer notes that there are two major reasons for using a dedicated downdraft table for collecting dust as opposed to trying to route a bench through a dust collection system. "It's far more efficient in regard to the motor and the electrical to generate the downflow inside the unit rather than piping it through ducting." For shop owners who are considering purchasing a downdraft table, William Fitzpatrick, applications engineer for Addison, Ill.-based Dustvent Inc. has a recommendation. "Airflow is the key. A good downdraft table will have a high velocity profile at the top of the bench. If you don't have enough velocity air flow, that is, going into the bench, you're not going to protect the breathing zone of the operator," he says. Blunt believes shop owners should also watch for filtration level of a table. "For me, that would be the number one thing, the micron rating and the efficiency." Troyer adds, "You definitely want to look for any user-friendly features. The top surface is extremely important you'll want a surface that won't scratch or mar your work. You want one that will help hold your work in place. And, depending on what you're doing, make certain the filtering system is going to meet your needs," he says, adding "One of the things to remember is that as you get to a lower micron, you're going to cut down on your air flow, your cubic feet per minute."